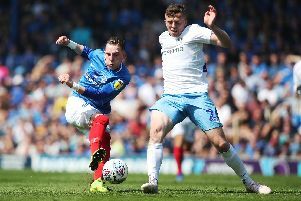 Pompey have no fresh injury worries ahead of Saturday’s trip to Rochdale. The Blues fielded a strong reserve side against Oxford United on Monday night, with all those who took part subsequently given a clean bill of health. Meanwhile, Dion Donohue today returned to full training after recovering from a hamstring problem. That leaves Andre Green as Pompey’s sole absentee, following an operation to remove a cyst on his knee. Kenny Jackett is weighing up whether to recall Brett Pitman to his starting line-up after scoring in three-successive appearances. Jack Whatmough is also pushing for a return, having proven his fitness in the reserves on Monday.